The Nile Valley had to be the absolute worst place in the world to be a farmer. That damned river flooded all the time, and wiped out crops left and right. The worst thing was that you never knew what would get ruined - one week you're fat and happy with a great supply of flax, and the next week, all your papyrus is under water and black mold is growing in your barn. Actually, I have a funny feeling that might not have been exactly how it worked, but if the only education on the topic that I ever got was from the game Nile, I would be of the opinion that the only job worse than being a farmer in ancient Egypt would be the slave who had to build all those national treasures. And since the guys who made Nile (the game, not the river) wanted to recap every crappy job in North Africa, they made a deluxe version with pyramids and sphinxes and obelisks. That way you could not only be a frustrated farmer whose crops keep running down the river, you got to experience the thrill and exhilaration of seeing all your stonework eaten by grasshoppers. 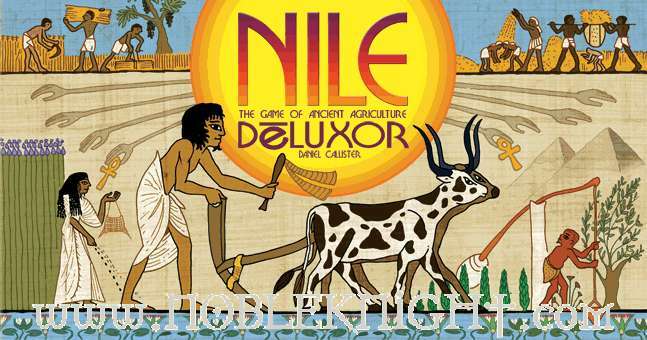 I've already reviewed Nile once (read it here), and I liked it. It's a very European-style card game with some nice friend screwage and a clever scoring mechanic that makes sure you can't just score the lucky win. But the original suffered from a few painful problems, the worst of which was that the cards would fall apart. Happily, the cards are really nice now, and the Chinese printer in charge was probably executed for making the government lose face. The upgraded version, and the version you want to get, is called Nile Deluxor, which actually has no relation to the casino in Vegas. It's still essentially the same game, but the inclusion of the monuments makes it a great deal more interesting and provides even more tricky decisions. Now on top of all the other stuff you could figure out, you have to decide whether or not it's worth your time to invest in stone bricks to build a sphinx. My biggest complaint about the gameplay in the original was the locust swarm, which would show up now and then and wipe out the best crop on the board. However, now that I've played it a bunch more, I actually really like the locusts. They make you plan ahead, prepare for contingencies, and occasionally make slightly desperate gambles. I thought the locusts were equalizers at first, but they're really not. They're more like one more knife the really good player is going to stick in your kidney. And so now I like them. The further plays of Nile proved another thing to me - this is not a game that you'll master after just a couple games. There are too many subtle elements working together, even if it is a very simple game. Nile is a game that you have to want to play several times, and that's a pretty good reason for a lot of people to avoid it. 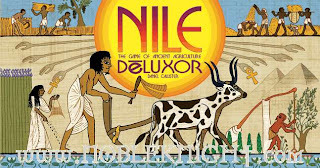 I am generally of the opinion that the responsibility for getting me to play twice lies with the game, not with me, but Nile is one game you'll need to try a couple times before you make up your mind. Of course, if you just hate Euro games, or if you need some bloodshed to make your games worth playing, there's no reason you should play Nile in the first place. You're not going to like it. It's one of those games that is mostly an abstract, and that uses just a couple basic concepts to make a wonderfully subtle and interesting game. That sounds an awful lot like a Reiner Knizia production, actually, though I think Nile has too many rules to be a Reiner game (there are almost a full page of rules, compared to most Reiner games that can be read while you're starting the car). Looks to me like Noble Knight is sold out of Nile Deluxor right now, but that's usually a good sign. They'll get more in soon. Hey good review, could use more reviews like this on BGG i am tired of reading novels when i just want a slight overview and opinion. I am gettin this game in the mail soon and looking forward to it! How would you compare it to say San Juan?